The ASUG BI Community thanks you for completing the survey. We continue to reach out to our ASUG Members to better understand where ASUG can help and how we are doing in delivery to your educational, networking and SAP influence requirement. In this latest survey we asked for your feedback on 2018 and what we needed to strive for in 2019. This year we received over 40 more responses than last year, which shows interest is growing. Q: Which tools are you currently using? 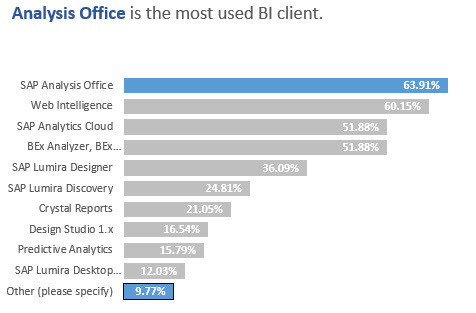 This year, for the first time, SAP Analysis Office is the most used BI Client. Last year it was Web Intelligence. Both of these topics and more will be featured at the BI+Analytics Conference in March. SAP’s Gregory BOTTICCHIO provided a great webcast last week, BI: Roadmap: What is the Future of SAP BOBJ Web Intelligence (BI 4.3)? The other field had non-SAP tools such as Qlik. Q: What are your company’s plans for the next 6-12 months? Q: Where do you go to obtain your information? 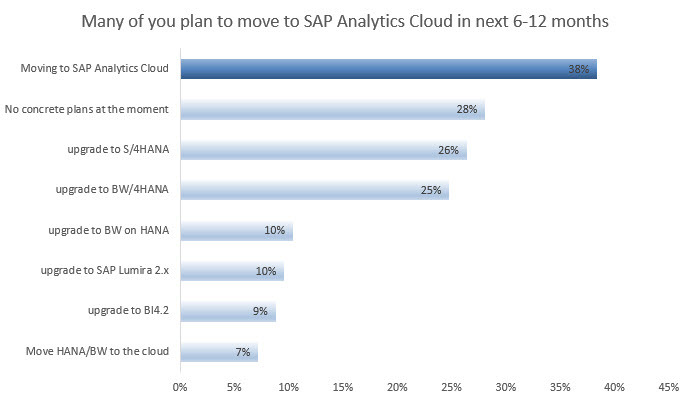 91% of you use the SAP Community and many of you (65%) say you use ASUG.com. The word cloud for other was “Google”. Q: What other topics would be of interest to you for Webcasts and Conferences? 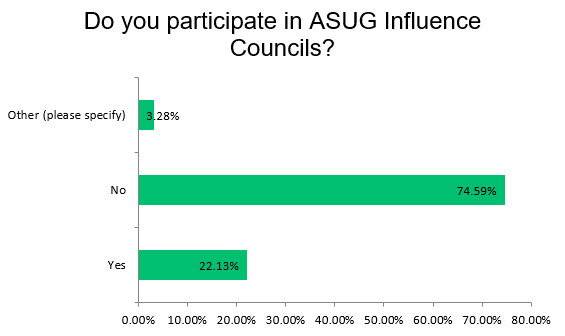 Q: Do you participate in ASUG Influence Councils? The responses on this one show we have some work to do. What do you think? We also actively review the surveys after each webcast, so please join us in 2019 for our webcasts and give us your feedback.